Scientists have discovered a new type of bacterium in the U.S. that can cause Lyme disease. Previously, a strain called Borrelia burgdorferi was the only known cause of Lyme disease in North America, although other continents have other bacteria strains that can cause the disease. Lyme disease is spread through tick bites and is common in the north-east U.S. Around 300,000 people in the U.S. are diagnosed each year. The disease can cause fever, pain, rashes, and fatigue. Without prompt treatment, other issues like chronic fatigue, cognitive problems, and joint pain can develop. The new bacterium, Borrelia mayonii, was found in ticks present throughout the Midwest, in states such as Wisconsin, Minnesota, and North Dakota. The findings were recently published in The Lancet Infectious Diseases. Researchers from the Mayo Clinic and the Center for Disease Control and Prevention (CDC) found the new strain after testing the blood of 9,000 Lyme disease patients in the Midwest. Six of the blood samples studied had a different type of bacterium than the previously known B. burgdorferi. The newly discovered bacterium also seems to cause a different form of Lyme disease, with additional symptoms including nausea and vomiting. As well, this form of Lyme disease seems to cause higher concentrations of B. mayonii to appear in the blood. Half of the patients with the bacterium also suffered from neurological abnormalities, and even more concerning, two of them were hospitalized. Despite these findings, Dr. Jeannine Petersen, a CDC microbiologist, says that it is unknown whether B. mayonii is more dangerous than B. burgdorferi. Since the study only found six patients with this new bacterium, research will have to be done with a greater number of patients. 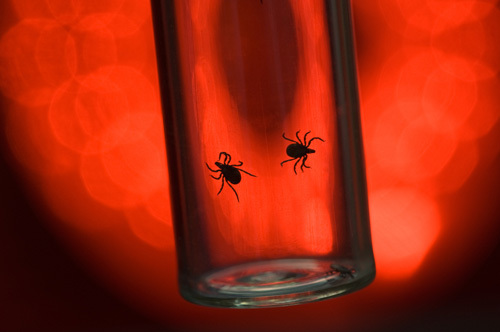 The new Lyme bacterium was not found in any blood samples from people outside of the Midwest. The researchers analyzed 100,000 Lyme blood samples from people across the country, but only found B. mayonii in six of the patients from the Midwest. “At this time there is no evidence that B. mayonii is present outside of the upper Midwest,” said Bobbi Pritt, M.D., first author of the study and director of the Clinical Parasitology Laboratory at the Mayo Clinic. The researchers also studied 600 black-legged ticks. B. mayonii was only discovered in three percent of them, while B. burgforferi is found in about one-third of black-legged ticks. These findings indicate that the newly discovered bacterium is rarer and less likely to affect people, especially if they don’t live in the Midwest. However, it is also possible that the form of Lyme disease it’s causing is more serious. While traditional Lyme disease can often be identified by the “bull’s-eye” rash left by the tick bite, Lyme caused by B. mayonii bacteria seems to result in a rash with a more diffuse pattern, making it harder to identify. However, B. mayonii Lyme disease responds to the same diagnostic tools and treatments, according to the CDC. It is recommended that people take steps to lower their risk of developing Lyme disease. Precautions include wearing long sleeves and pants when going into parks or wooded areas, using insect repellant, and checking yourself and your pets for ticks after coming in from the outdoors.